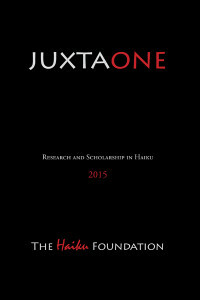 You already know Juxtapositions, The Haiku Foundation’s scholarly online journal. Now you can get it in book form, too. THF announces the publication of JUXTAONE and JUXTATWO, full-color print versions of Juxtapositions 1.1 (2015) and Juxtapositions 2.1 (2016). JUXTAONE features new articles by Ian Marshall (“Jouissance among the Kire: A Lacanian Approach to Haiku”), Alexander B. Joy (“Aesthetics of Discipline: Tranströmer’s Prison Haiku”), Charles Trumbull (“Shangri-La: James W. Hackett’s Life in Haiku”); archival articles by Haruo Shirane (“Beyond the Haiku Moment: Bashō, Buson, and Modern Haiku Myths”), Susumu Takiguchi (“Karumi: Matsuo Bashō’s Ultimate Poetical Value, Or was it?”), and Jim Kacian (“The Shape of Things to Come: Form Past and Present in Haiku”); an interview of Itō Yūki by Udo Wenzel (“Forgive, But Do Not Forget”); book reviews by Michael Dylan Welch and Jerry Reed, Jr.; a bibliography of what belongs in a haiku scholar’s library; and haiga (haiku painting) from Guy Beining, Ion Codrescu, Annette Makino, Ron C. Moss, Marlene Mountain, Ellen Peckham, Alexis Rotella, and Lidia Rozmus, with commentary by Stephen Addiss. 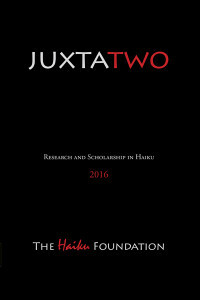 JUXTATWO (dedicated to haiku poet, editor and publisher Cor van den Heuvel on the occasion of his 85th birthday) features new articles by Sandra Simpson (“Snapshot: Haiku in the Great War”), Judy Kendall (“Jo Ha Kyū and Fu Bi Xing: Reading|Viewing Haiku”), Charles Trumbull (“Masaoka Shiki and the Origins of Shasei”), and Ian Marshall and Megan Simpson (“Deconstructing Haiku: A Dialogue”); an interview of Cor van den Heuvel by Jim Kacian “(a stick over the falls”);  commentary on some of van den Heuvel’s most iconic poems by several authors; book reviews by Melissa Allen, Ce Rosenow, and Michael Dylan Welch; a annotated bibliiography of haiku dissertations and theses by Dr. Randy M. Brooks; and haiga from Stephen Addiss, Pamela A. Babusci, Ion Codrescu, Terri L. French, Ron C. Moss, Marlene Mountain, and Ellen Peckham, with commentary by Stephen Addiss and Jim Kacian. 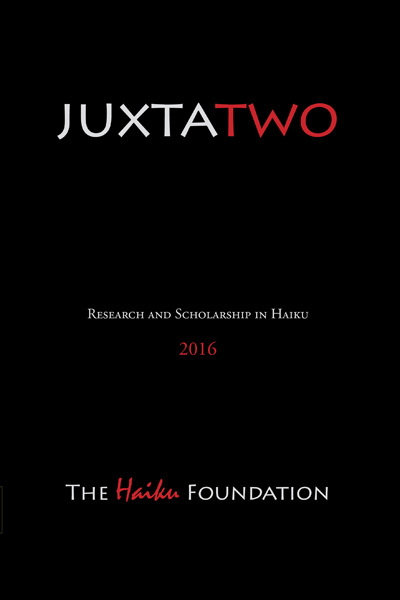 The only way you can get copies of these great new additions to haiku scholarship is by donating to The Haiku Foundation. You can find a limited number of each in the THF Gift Shop. Once we are sold out, these substantial books will only be available on the createSpace website for substantially more money. Order yours today. Your support is greatly appreciated.